Welcome to the Carphone Warehouse complaints department brought to you by HissingKitty. Experienced poor customer service? 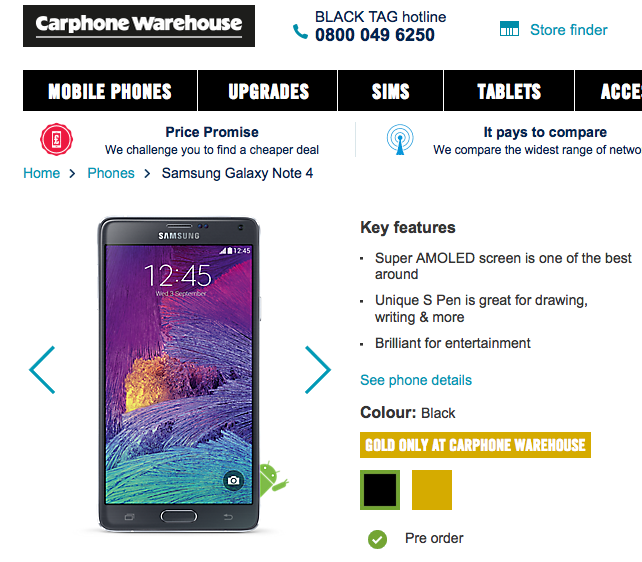 We make it easy to file a formal complaint against Carphone Warehouse online. Simply use our free form and your feedback will be instantly forwarded for review. Need to contact the Carphone Warehouse corporate office? We have the mailing address, phone number, and email address listed below. On the 13th June 2016 I handed in my phone for repair to my local Carphone Warehouse store in Cannock. On the 17th June the store sent my phone, along with four other people's phones, to the repair centre. I received an email informing me that my phone would be ready to pick up from the store on the 29th June. On the 29th June I arrived at the Carphone Warehouse store in Cannock only to be told that the box containing my and the other four people's phones never reached the repair centre and they don't know where they are. On the 4th July a form was sent to Customer care from the Cannock store which was supposed to start things moving toward replacing my phone. Since then, the store, the repair centre and the Customer Care centre have all been fighting between themselves as to who is responsible for my phone going missing and resolving the issue. Meanwhile, I'm stuck without my phone and no sign of the situation changing even now, a month later. I and the staff at the Carphone Warehouse store have made repeated calls to the so-called customer care centre and all they do is request forms to be filled out and argue between themselves. Today, the 13th July, after visiting the store, I again called the customer care centre and asked to place a formal complaint. The guy on the phone did that for me, gave me a reference number and said it would take a further three to five days to be dealt with. As you can imagine, as a month has already passed, this is just not good enough. I shopped around and saw a phone I liked in their inventory. So I called the Carphone customer service number but was repeatedly given the "run around" until I gave up and hung up. I recently brought a Samsung Galaxy note 4 gold from carphone warehouse bout 2 months ago i had a virus on me phone my dad factory reset me phone for me and noticed the top screen was coming loose I had taken it back to the store where I had brought the item from all I got was a load of abuse from a member of staff they didn't want to sort out the problem at all there words were I could buy a new mobile I explained to them that I didn't know the phone was damaged when I brought the mobile they tried to blame my 4 year old little girl I had to defend her all my little did was play on games he said me daughter some how damage the phone I said she couldn't have only being a child. I explained if it doesn't get sorted out I'm taking it to the Leicester Mercury and to a small claims court I don't expect to pay £500 for a mobile phone only to last 2 months it's ridiculous and the carphone warehouse couldn't help me all they did was accuse my little girl who is only 4 years old I was defending her I would just like this being dealt with its there fault and they can't even sort it out just throw accusations at people was place ever to buy a phone from I have also a white note 4 had bout 9 months now and there is nothing wrong with that mobile and my little girl played on them both don't know how the gold one was damaged when brought it would someone please help me. Have feedback for Carphone Warehouse?